First find out what kind of food you want to make. Do you want to make a donut, cake or hamburger? Search for inspirations either online or from cookbooks/magazine. My favourite is FoodGawker and Pinterest, the submissions/pins are photoed in brilliant photography that makes both your mouth drooling and your stomach rumbling. Draw your design on a sketch book to help you visualise your work. I find this really helpful in letting myself know what exactly I want, especially in the later stages. I've sketched in the same size scale and added labels of what layer it is on each section (it's almost like biological labelling diagram). Figure out how to create the best colour and texture by working on an experimental piece of clay. 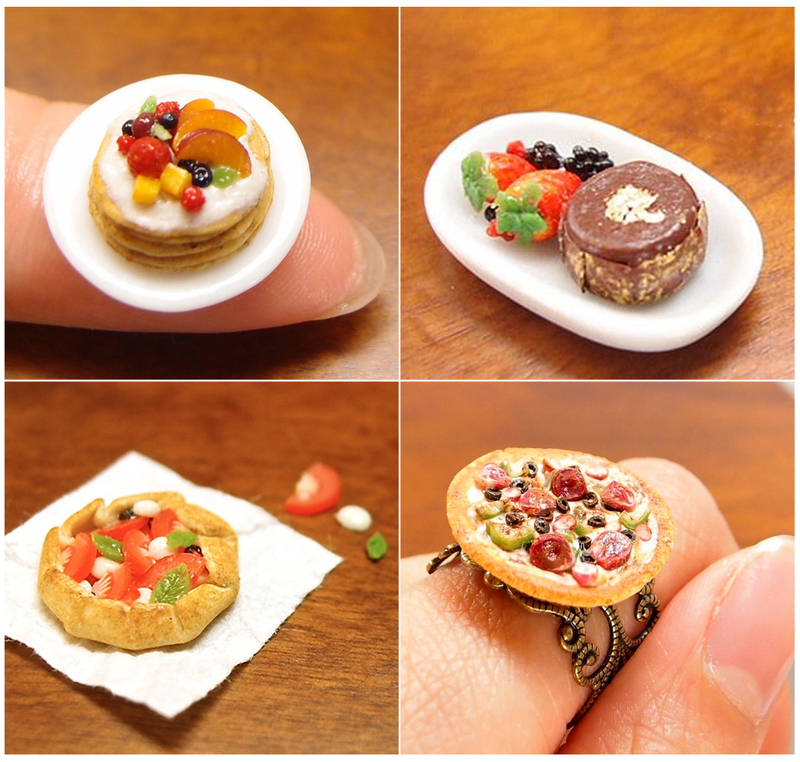 If you couldn't think of any idea how to make it, always search online for miniature tutorials. Your favourite miniaturist might have some posts that give you some ideas. This is pretty self-explanatory, time to dig in and create your work! My favourite tools are size 0 pointy paint brushes, toothpicks and X-Acto craft knifes. The key to this is to be patient. Many things can go wrong, maybe it does not look like what you expected or in a miniaturist's nightmare, you dropped the tiny bowl of blackberries you have been working for six hours onto the floor. Sometimes you might need to re-do your work, other times perfecting it. But once you've gone through the process, you will be so happy about your work! I love that you start with a sketch! I wish I had the talent/patience to do that, too (I'm more of a dive-in-and-learn-as-you-go kind of crafter XD ). Also, I'm happy to know I'm not the only one who browses Foodgawker mainly for mini-inspirations, rather than actual recipes :D that's seriously a goldmine of inspiration! Quote: Don't Merely Exist. Live.